Most people watch sports absorbing nothing but potato chips and cheap beer. Michael Smith has been watching sports his whole life, but he hasn’t just been watching—he’s been learning. 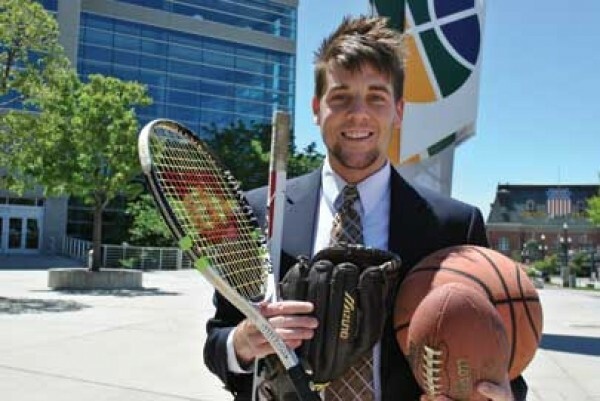 Smith, who’s 22 and graduated from the University of Utah in May, beat out 26 other collegiate competitors from around the nation in ESPN’s The Schwab sports-trivia competition. I wanted to compete because I love sports and I knew I would be a good candidate. ESPN e-mailed the Pac-12 conference and they communicated with the U. I first did a casting call via Skype so ESPN could determine if I was worthy. I was elected to be on the Pac-12 episode. In the first episode, I defeated kids from Oregon State and Stanford—which felt especially great because Stanford did not admit me for undergrad. I didn’t go to ESPN until the final. I won my semifinal round with a one-point victory and went to ESPN a few weeks later with my dad. I was really glad he came, because he likes sports a lot, too, and has always supported me. I was confident going in to the final, but I became nervous as the day went on because of how smart they were and how much they knew about sports. Have you always been a sports enthusiast? I have always been obsessed with sports. My first sports memory is watching the 1996 Stanley Cup Final with my father when the Colorado Avalanche won in four games. They have been my favorite team ever since. I have followed all the pro sports leagues since I can remember (NHL, NBA, MLB and NFL), as well as golf, tennis and soccer. I was fortunate enough to attend the 2002 Winter Olympics, and my dad and I went to two hockey games—we cheer for Canada because that’s where he’s from. I look up to ESPN’s Skip Bayless, Michael Wilbon and Tony Kornheiser—all former columnists. My favorite sports columnists that I read every day are Cathal Kelly from the Toronto Star, Bill Plaschke from the Los Angeles Times and Dan Le Betard from the Miami Herald. My favorite athletes are Jonathan Toews of the Chicago Blackhawks, Patrick Marleau of the San Jose Sharks, Paul Bissonnette from the Phoenix Coyotes and Derek Jeter of the New York Yankees. I’m moving to Chicago in September to attend Northwestern’s Medill School of Journalism. I’m excited because it’s one of the top journalism schools in the country and many sports reporters (Michael Wilbon, Kevin Blackistone, Luke Winn, JA Adande) have gone there. After getting my master’s, I hope to be hired for a national paper—or at least a big local one, like the LA Times—and become a beat writer for a pro sports team and eventually have my own column.